I’ve been fascinated by the idea of home brewing for a long time, chatted with numerous home brewers and tasted finished products, but never sated my intrigue for the home brewing process. Until last Saturday. Greenville Hop House, my favorite bottle shop in town, is also a home brew supply shop and all-around awesome place. This East North Street store is packed with brewing supplies and frequently hosts Saturday home brewing days. 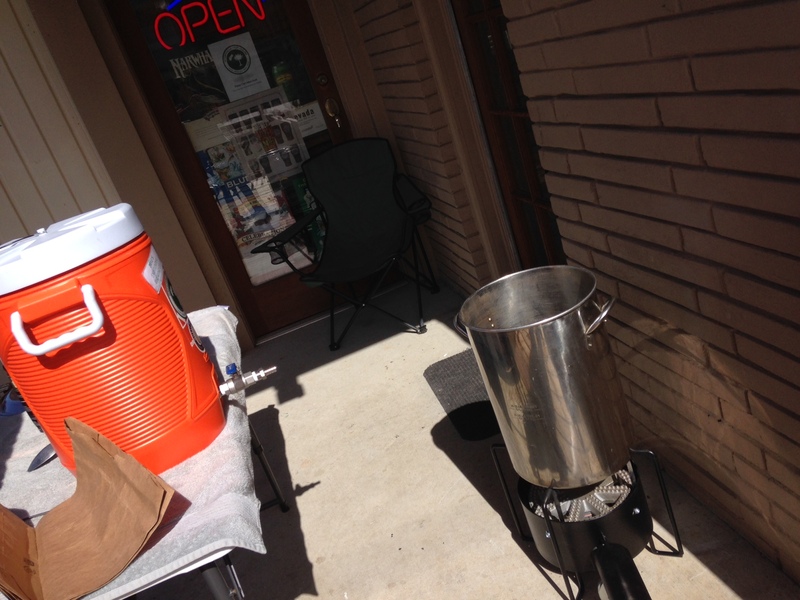 I hung out for a few hours last Saturday and again on Wednesday to watch my first home brews in action. Manager Andrew Myers and his brew mate, Mike, were kind to explain all of the ingredients, steps and science behind the brewing process. 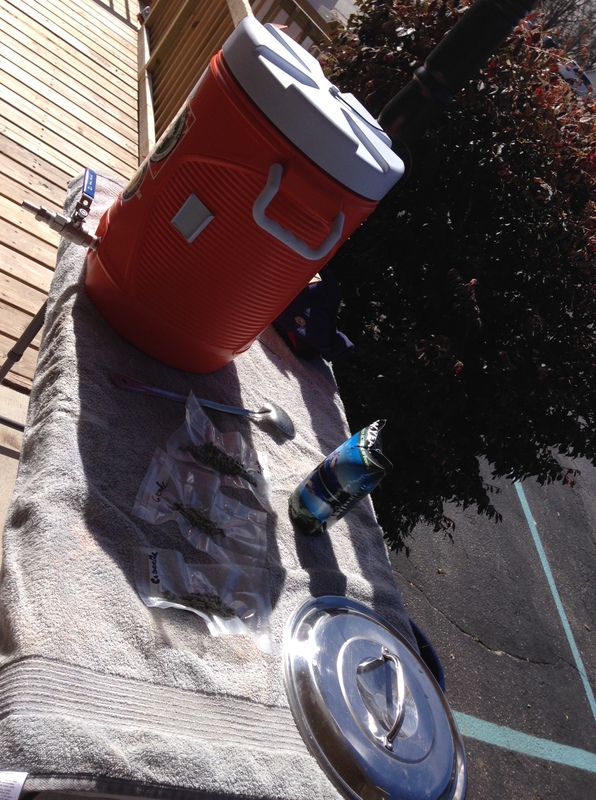 This perfectly sunny, warm Saturday saw the creation of a Bell’s Amber ale clone. The all-grain recipe called for both Fuggle and Cascade hops. As the sparging began, we were treated to a visit by Ben Pierson and Travis Long from Swamp Rabbit Brewery. Ben shared that brewing has begun at Swamp Rabbit and they’re aiming to open the third week of March. I can’t wait to finally try his beer! A few other chaps dropped by during the brewing process—there is a never a shortage of nice, entertaining beer lovers at Hop House. The three-gallon recipe took approximately four hours from first boil to the final straining into the carboy. On Wednesday I witnessed the first step of an all-grain, brew in a bag. This convenient and efficient setup entails putting a bag inside the kettle, which closes firmly around the rip and holds all of the ground grains. This day’s brew leader, Stuart, explained that the more finely ground grain ensures you get all of the sugars and eases the clean-up. I could offer a more detailed description of what went down at each step, but honestly, I was the only one who’d never brewed and am still a noob to the whole process. 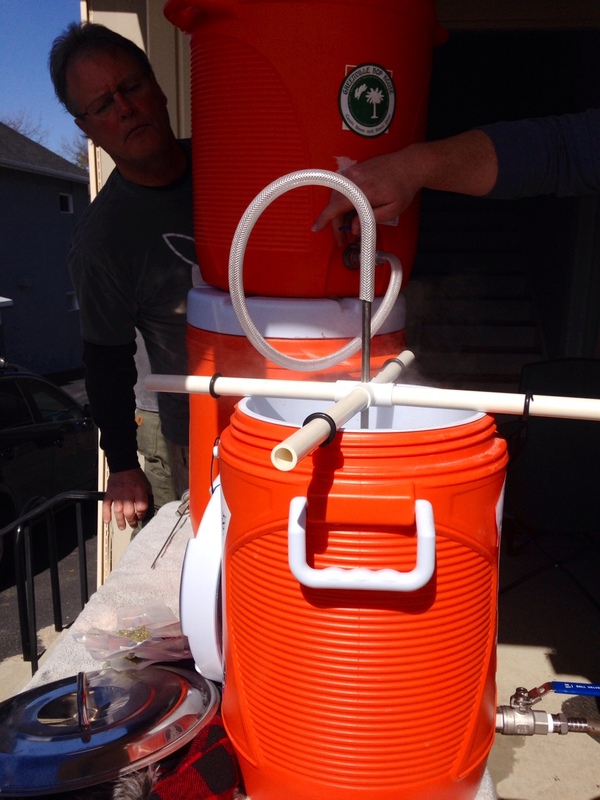 For some more info about home brewing, check out this link and scroll through the pics. Or better yet, stop by Greenville Hop House one Saturday and let Andrew show you how it’s done. Follow GHH on Facebook and Twitter to find out the next home brew date.